Nine programmable settings of operation and its compatibility with all spreaders, make the MESP 3016 a basic, yet efficient system. 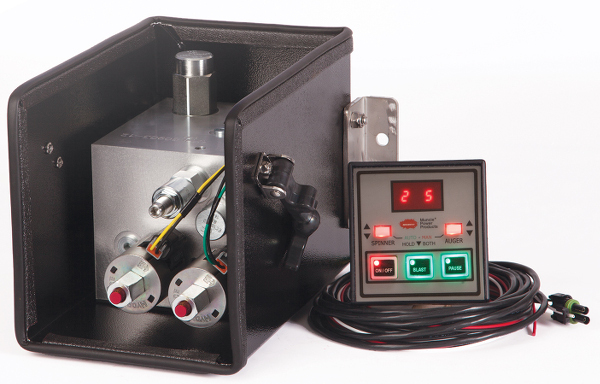 The MESP 3016’s controller can operate in auto or manual mode. Durable, soft toggles and illuminated soft-touch buttons on the MESP 3016’s controller, make adjusting flow rates simple. Spinner flows up to 8 GPM and auger flows up to 17 GPM are achievable with this spreader package. With its hydraulics mounted outside the cab, the MESP 3016 reduces noise, heat, fumes and potential danger posed to the driver by high pressure fluids.